The Philips Veradius mobile c-arm offers innovation in the form of a flat detector. This has advantages such as a large field of view and a thin profile that frees up space in the operating room or wherever the unit may be. The flat detector is not affected by geometrical distortions and can then be positioned freely. It is not affected by magnetic distortions either, so the imaging device can be positioned even near magnetic resonance imaging units. The Veradius c-arm is foldable and easily maneuverable with foot and rear wheel steering. Wherever you roll it for use, if provides superb contrast for cardiac, vascular, and orthopedic procedures. It promotes efficiency with fast start-up times, streamlined workflow, and consistent image quality. The latter is achieved via automatic calibration and a high resolution 1.6k x 1.4k image matrix. The unit attempts to get the best pictures at the lowest doses, and the removable grid facilitates this. The Veradius can go a long way and can run for longer periods due its excellent cooling capabilities. 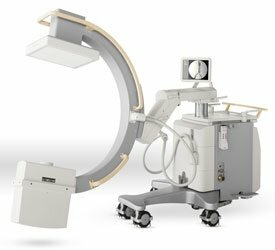 Take the time to check with Providian for a refurbished Philips Veradius c-arm unit. It’s the innovative solution to your surgical imaging needs. I want a free price quote on the Philips Veradius, send it today!